All shopping for food and other essential supplies must be done during the warmer summer months when flights into the bush are more reliable. Any trip to the 'outside' will result in stocking up on supplies. 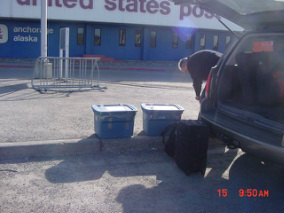 All food needs to be packed into 70 lb boxes or tubs in order to be flown into the village. This may mean many trips to the post office when annual shopping is underway. Any unscheduled flight out to Anchorage at any time of the year, invariably results in an opportunity for more food stock up. 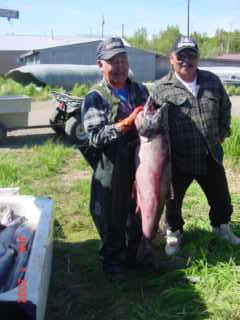 Locals with a salmon during the gathering months of summer. 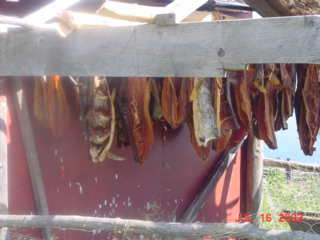 A drying hut for salmon. Summer is a very busy time for the hunter / gatherer. The short summer months are the time of long daylight hours, meaning everything is out: animals, fish and food such as berries and wild spinach.Everything is growing quickly. Summer is the time when much of the food is gathered in readiness for the long harsh winter months. 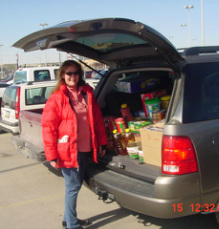 The station wagon loaded with winter food for transport to the apartment and repackaging. Everything that is bought in the city, must then be re packed into shipping boxes or tubs to be flown out to the bush. Grocery shopping waiting to be unpacked. Alcohol may be shipped in, but only into a 'damp' or 'wet' village. A 'dry' village means no alcohol consumption at all. 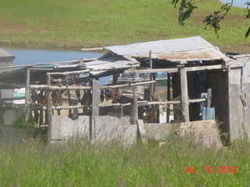 A 'damp' village allows alcohol consumption but no selling of alcohol within the village. There is a strict limit on quantities to be brought in. Alcohol has wrought havoc with native culture. Salmon strips drying in the hot sun of summer. 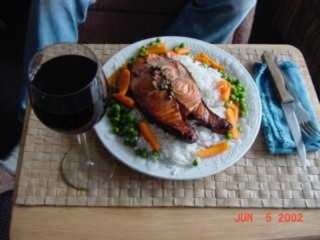 A meal made up from local gathering and bought provisions.